The Cuban In My Coffee: Chistmas Tree Time, Making Your Own Best Tree Ever! Chistmas Tree Time, Making Your Own Best Tree Ever! Good morning and Happy December!! We are well in to the holiday season this year, and a big part of the season is the the Christmas tree. To me this is one of the things that I look forward to the absolute most. I change things up just a touch each year, and over the seasons I have been collecting different things to add to my collection allowing me to switch it up. 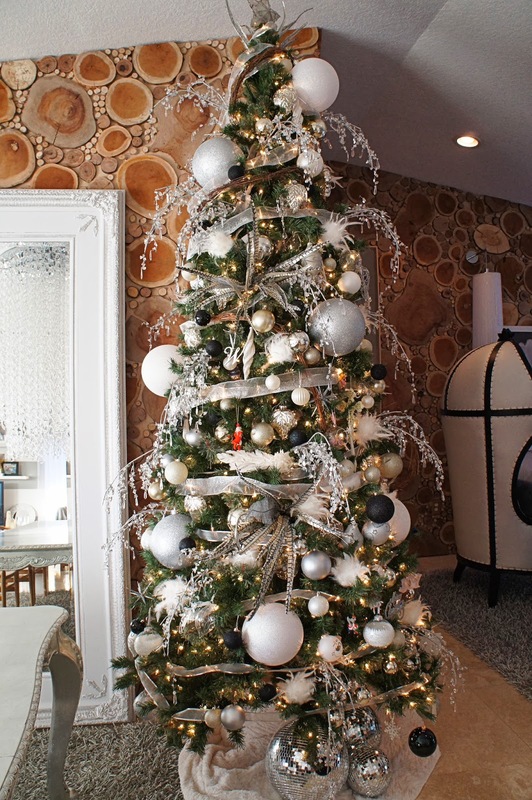 This year I decided to make our tree devoid of color and go back to a white, black and silver tree. I admittedly have quite "THE" Christmas tree each year, and though I don't mean to brag I can tell you that it has sparked some Christmas tree envy year after year. I have quite a few tree enthusiasts that have asked me how they can create their own designer tree so I figured I would share some love and give you a bit of a tutorial on how to make your own should your heart desire. Let's start by taking a look at this year's tree. This year I decided to remove the color from the tree and instead go with a very modern neutral pallet. I took out all the purple and red that I had last year just for something different. I only needed to buy a few new things such as the extra large silver and white ball ornaments which are a whopping 8-10" diameters. The rest of what's on the tree are things I already own and rotate in and out year by year. Take a look at last year's tree with the colors we had. Though the shades of plum and purple are stunning no color was to be had this year. Here is a close up of this year's tree so that you can see the difference. 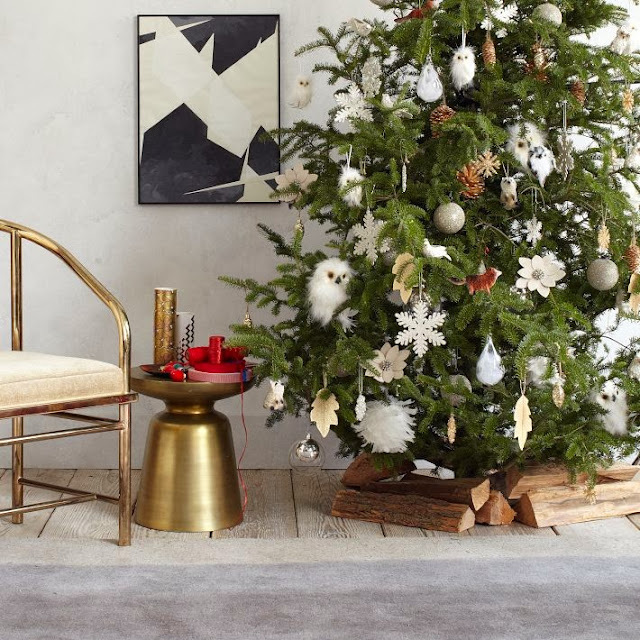 Let's talk about how you can create your own designer Christmas tree with this handy little step by step, and some tricks that I use along the way. The first step is to figure out your tree theme. Do you have specific colors that you are shooting for such as my white and silver tree? Do you want it to be covered with any one type of theme such as the beach, or a Disney tree perhaps? 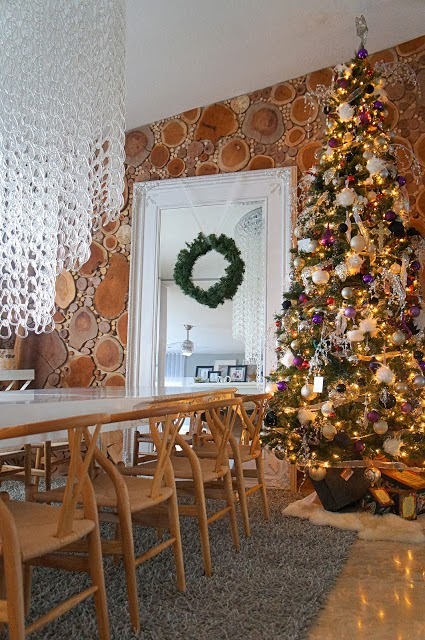 Do you want an "organic" tree with burlap and wooded branches? 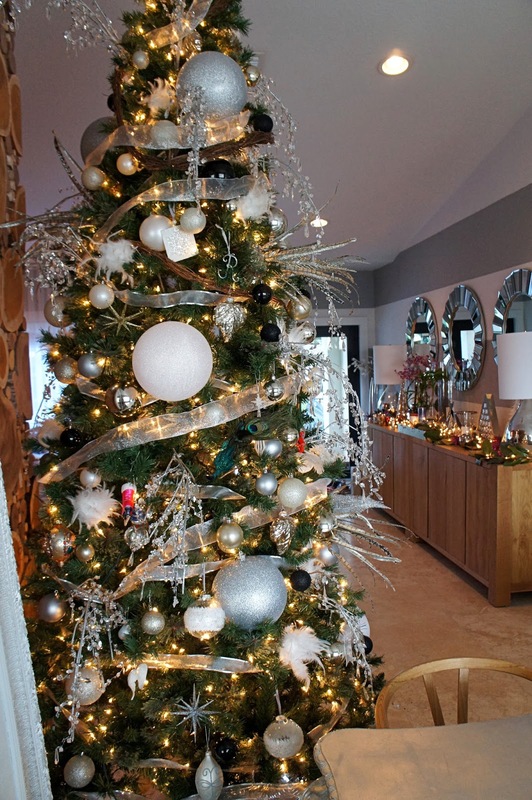 Establishing your tree theme will help you know what to buy when you are out or going through what you already have. My tree has a color theme, but not one specific type of item on the tree. 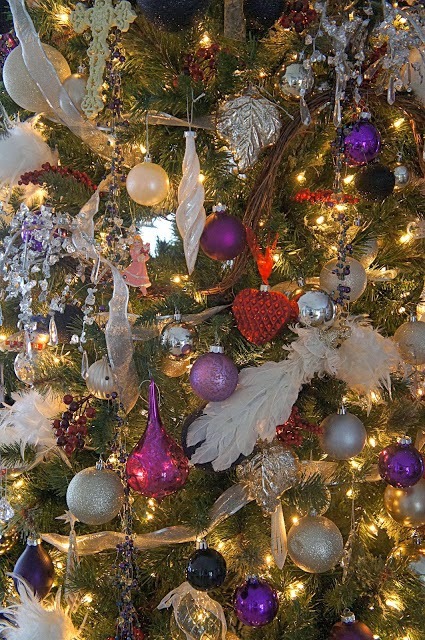 A rule of thumb when decorating your tree is to remember that "More is More"! You will always need more than what you thought you would. The joke in my family is that if I put one more thing on our tree it will topple over! The joke is on them though because I have my eye on some large glittery flowers at Z Gallery which are too expensive, but I'm waiting patiently for them to go on sale so that I can scoop them up, and by scoop them up I mean by about a dozen. I doubt these pretties will make the tree actually topple over, or so I hope. - 2 extra large plastic bins of ornament balls in varying shades of white, silver and black from Wal Mart and Target from years ago. I have no idea how many this equates to, but it's allot! 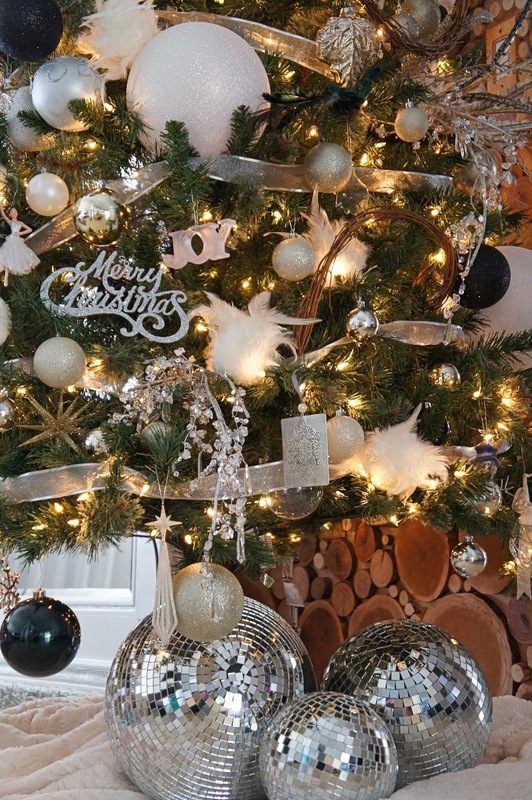 - 10 new extra large 10" glittery ornament balls from Wal Mart this season. - 22 crystal sprays from Z Gallery bought over the past 3 holiday seasons. - 4 large feather sprays from Michael's Crafts bought years ago. - 14 mercury glass leaves bought last year from Wal Mart last season. - 28 white feather ball ornaments bought last season from Wal Mart. - 3 varying sized disco balls under the tree, and I'm on the hunt for more! - 2 round spools of wood garland from Michael's crafts bought years ago. - 2 rolls of silver ribbon bought years ago at Michael's crafts. - Many varying specialy ornaments, and by many I mean MANY bought and collected through the years. - Possibly a living child in there somewhere. - Sometimes an elf on the shelf. Bottom line is that there's a whole lotta stuff on that baby! Now if you are thinking this is a costly venture, it can be, but with some money saving tips and an eye for what you're looking for you can save some money and also buy things little by little through the years. Here are some of the tips that work for me. One of my hidden gems for Christmas decor is actually Wal Mart people! You don't like that place? Join the club, but I go every year just to see what they have. 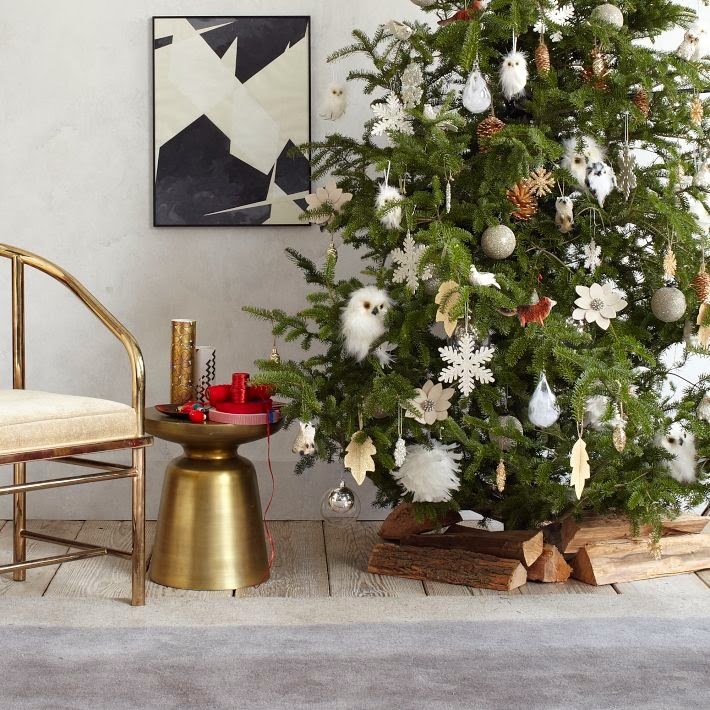 Have you seen the feather balls from West Elm out this season in the picture below??? West Elm sells them for $9.00 each (on sale now for $6.00). I bought mine last year from Wal Mart for only $2.99 each and I have 28 of them so you do the math. It's important to know that their inventory changes every year, but I highly recommend going. 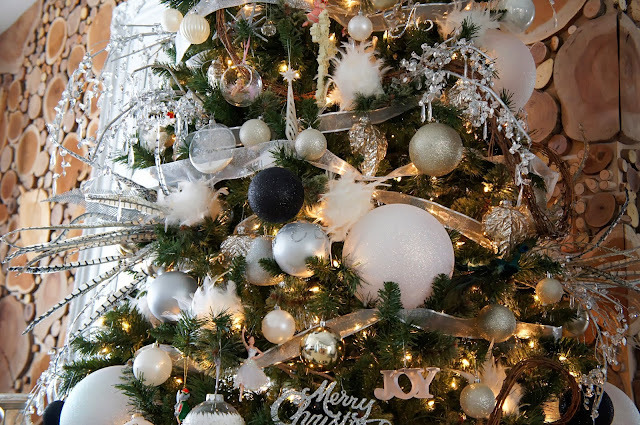 This year I bought 10 of the white and silver extra large ball ornaments in 10" diameter for $5.00 each. 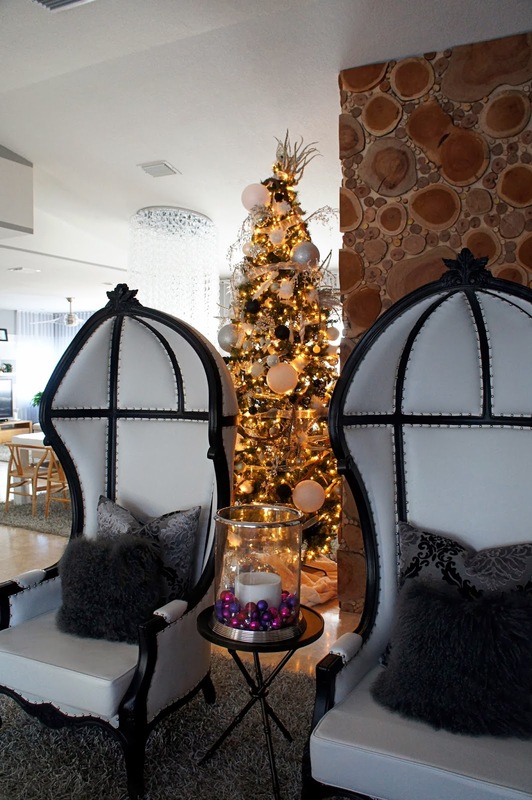 They are huge and you don't need too many of them on the tree to make a statement. They completely upped my tree a notch. 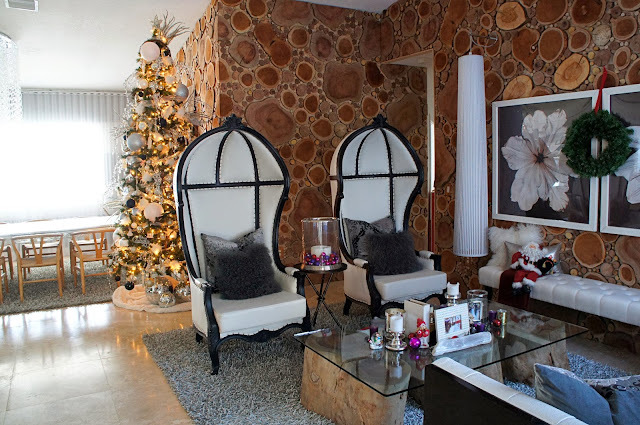 Another money saver for great holiday decor is finding the sales. All of the stores have them because all of the stores need to move that inventory. I have 22 crystal sprays from Z Gallery which were originally $14.95 each which would have cost me about $329 for some crystal branches???? I think not! I bought 5 of them for full price about 5 years ago, and then another few about 2 years ago. Last year a good friend gave me a tip about their end of season sale for 75% off all holiday decor. Well, I scooped up about 15 of them and paid a fraction of the cost at 75-80% off you can't beat it. Believe me most every major retailer has their holiday decor sales so be on the look out. Some other gem stores that I go to are Home Goods, JC Penny, and the Ace Hardware in Coral Gables which has a little boutique in it. The point here is that yes it can cost you to buy everything all at once, but if you are a savvy shopper and buy a little bit each year you can build in to the tree of your dreams. I've been at this for about 7 years people. 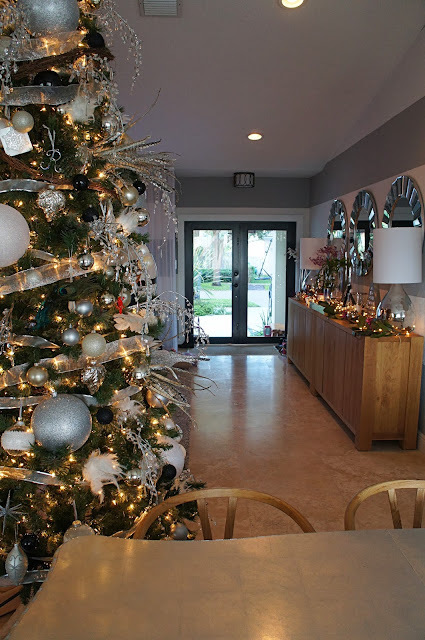 The picture below shows you a good view of the crystal sprays and the extra large ball ornaments on our tree. Don't forget underneath your tree. In the picture below you can see a close up of my tree skirt and the disco balls that I am collecting (and wanting more of) that are under our tree. The skirt is a faux fur throw that I bought at Target last year on the cheap. I love this idea which was given to me from a friend because it covers more ground than a typical skirt. How about those disco balls??!! I found the large one at a yard sale for only $20 bucks, and the other two on Craig's list for $25. I'm looking for more and hope to one day fill the entire bottom the the entire tree with these lovelies, but they can be expensive so I'm on the hunt for my own deals. Let me know if you have one laying around, I'll scoop that baby up (or you can just put it under your tree). Now that you have all of your goodies to put on the tree, let's go step by step. Step 1: Wrap ribbon all around the tree from the top of the tree to the bottom. **Your Step 1 might be stringing the lights. I have a per-lit faux tree, and no I do not miss a real tree or its needles. I live in Florida and my real trees die very quickly, and with all the things I put on the tree the branches end up sunken on the floor. This is just my preference. Step 2: Hang all of your varying sized and or colored ball ornaments from the top to the bottom (and in the back). I didn't put the small at the top and the large at the bottom, I mix them up. Step 3: Hang all of your specialty ornaments in any areas where there are holes. 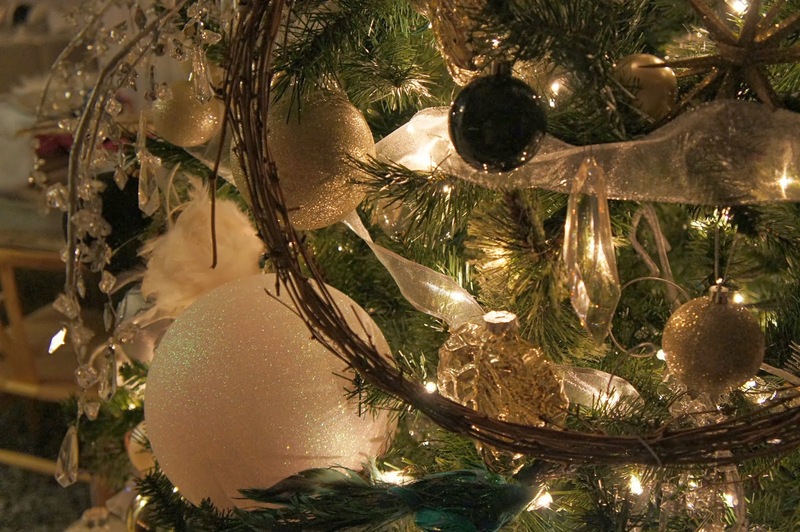 ** Tip, I add ornaments and balls on the inside branches as well. 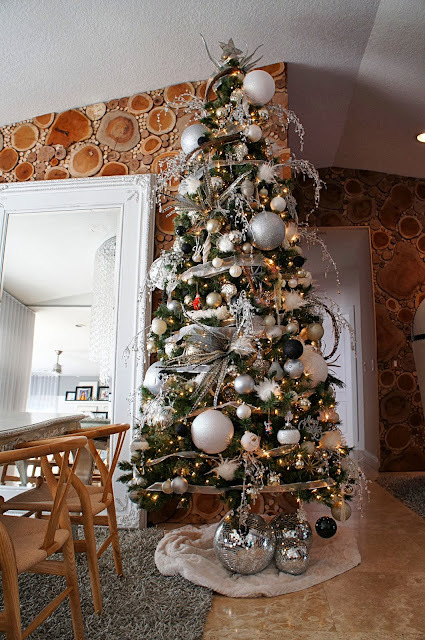 This gives depth to the tree, covers any sparse areas around the trunk especially in fake trees, and really makes a difference in the beauty of your tree. I highly recommend this. Step 4: Add your extra large ball ornaments. I waited until now because you can really get a feel for how it looks and where they need to be placed once everything is up. You can move things if needed. Step 5: Add your crystal sprays or flowers or twisted sticks tucking the stems deep in the tree so that only the prettiest parts show. Step 6: Hang the star or angel at the top. **Tip, I add to the back of my tree as well. It is visible from most every angle so I have to do this. I would hate to see a beautiful tree and then a big old bald spot in the back, wouldn't you? Step 6: Pour a glass of wine or a cup of hot chocolate and let the season begin! Here are some additional shots of our tree this year. Since we will be going out of town this Christmas I didn't go as all out on the holiday decorating as I normally would, but with a tree like this I don't have to! I love that this tree is a show stopper and I hope that some of these tips can help you to create your own show stopping tree this season!